Today was Day #7 of Chocolate and Cinnamon Theme Week. 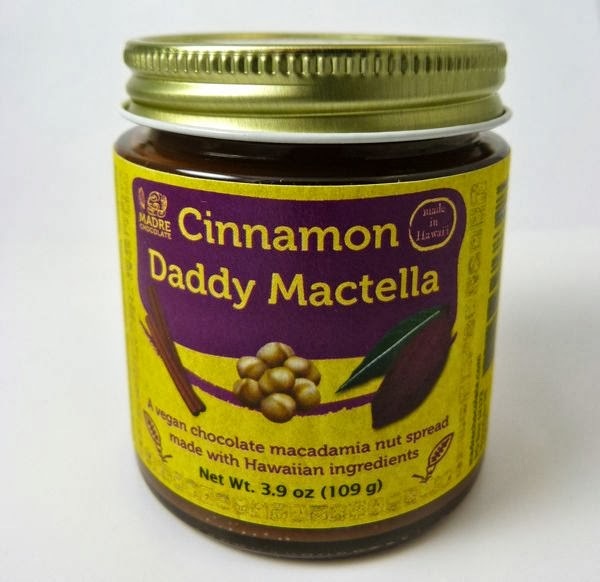 This flavorful Cinnamon Daddy Mactella spread, created by Madre Chocolate (Oahu, HI), came straight from Hawaii -- and was made from Hawaiian Hamakua cacao; Kona organic cinnamon; Kona macadamia nuts; and Hawaiian vanilla and sea salt. 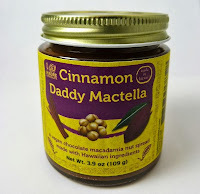 A bit of hazelnut oil enhanced the mild nutty taste from the ground mac nuts. The chocolate base flavor was strong and pure and wasn't drowned out by too much sugar -- a big plus when you have quality chocolate with complex, bold fruit/acid notes that kick in after the first bite begins to melt in your mouth. This spread would be delicious in a flaky pastry, as a ganache/filling, or on a piece of toast. However, I can envision many other uses*. Just eating a spoonful, a la carte, now and then would be pleasant as well. Aloha. Other suggestions on Madre Chocolate site: warm slightly and use on vanilla pannacotta or ice cream; use as a cake filling.